The historical setting: To understand how intent Charles II, the British king, was on punishing the 59 men who eleven years earlier had signed the death warrant for his father, King Charles I, on his orders Oliver Cromwell (1599-1658) was subjected to posthumous execution. 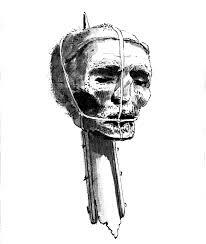 Cromwell was disinterred in 1660, his corpse hanged, then beheaded. His head placed on a spike on the roof of Westminster Hall, London. It remained there until a storm brought it down 25 years later. Found by a passer-by and hidden, it appears to have ended up in private ownership through the centuries, until finally buried in 1960. Of the other 58 regicides, five had died before the regency was restored, 13 were executed (hanged, drawn and quartered), 19 were imprisoned and 21 fled the country. Three of the last escaped to the English colonies. One of them ended up in Stow (or not). Hanged, drawn and quartered: In Britain, the proper order of events for a man convicted of high treason back in that era was that he be dragged behind a horse, on a simple wooded frame ("drawn"), then hanged but not to death ("hanged"), emasculated, disemboweled - the entrails and organs cast on a fire, beheaded, and finally, the body divided into four pieces ("quartered"), to be displayed at different places about the country. Quartering could be by cutting or by tying ropes from the limbs of the headless body to four horses. Heads of the executed were put on public display. The dispersal and display of body parts prevented a proper burial. All this is what happened to William Wallace in 1305, as portrayed by Mel Gibson in the movie Braveheart. William Goffe (1605-?) and his father-in-law Edward Whalley arrived in Boston in 1660. Within the year it became clear that the Royalist government was vigorously pursing their capture. Sympathizers to the anti-Royalist cause aided their escape, first to New Haven, then Milford, and then onward to Hadley, just west of Amherst, in 1664. There they lived a reclusive life until 1676, their true identities known only by a few. Goffe was able to maintain a letter correspondence with his wife, who had remained in England. He was using the name Walter Goldsmith, and in the letters they referred to each other as mother and son rather than wife and husband. He would never see his wife or children again. There is a perhaps apocryphal story referred to as "The Angel of Hadley," in which an elderly man with a sword and military expertise appears a sudden in Hadley in 1676, where he rallies the townsmen to fend off an Indian attack, then departs. The story identifies the hero as William Goffe. At this point the story bifurcates. One history has Goffe living in Hartford under an assumed name Duffell or Cooke, where he died circa 1680 and was buried in an unmarked grave. The other has him living in Stow near Pompositticut Hill (now Summer Hill, Maynard) under the name John Green/Greene, where he died in 1688. In this version of history he came to Stow because his sister lived here. According to the 2009 book Stow Things, Goffe's sister was married to Thomas Stevens. Stevens was one of the original settler's of Stow, circa 1684. The big problem for this version is that a biographical note about Thomas Stevens, buried in the Stow cemetery 1704, has him married to Mary Green, the daughter of Church Elder John Green, of Charleston. Mary had a brother, Captain John Green (1620-1688). More likely his was the body under the stone than William Goffe. 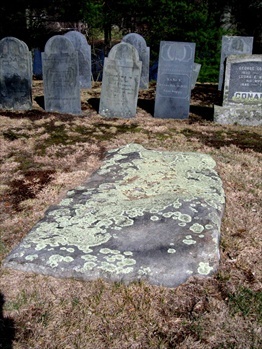 In Stow's Lower Village cemetery there is a ground-flush granite slab some 9 x 4.5 feet in size, with no inscription, supposedly Goffe's final resting place. In 1930 the grave was exhumed, revealing a man's bones but no skull. The enduring belief is that Goffe's grave was dug up shortly after his death, his head removed and brought to England for the reward. Maynard's best-known myth is much more mundane. As the story goes, circa 1720, a group of men showed up at the Thomas Smith family homestead asking for shelter from a storm, and were allowed to stay in the barn for several days. An account of the story: "The men were friendly and liberal with their money, paying generously for everything they obtained from the Smith family. The strangers were noted amusing themselves by throwing pieces-of-eight at the swallows around the barn. Before leaving, they procured some old clothing from the Smiths and made the clothing into sacks. They also asked to borrow some digging tools. Carrying the sacks, now observed to be loaded with something heavy, the men entered the woods in a northerly direction from the Smith house. When they returned, they were empty-handed. The men thanked Smith for his hospitality and left. They were never seen again." In time, Smith received a letter from a man claiming to have been one of the visitors. The letter stated that the writer and his companions had been pirates, now captured, convicted, and about to be hanged. The writer asked that Smith come to Boston to see them, promising information of great value. Per the story, Smith ignored the request. There is no mention of Thomas Smith or his family members searching for (or finding) buried treasure. The story begs the question of what might have brought pirates so far inland or how they had been carrying the treasure if they needed to make sacks. As for links to known history, John Smith came from England and settled in north Sudbury. Thomas Smith (1658-1718) was one of his sons, with a homestead on Great Road (Route 117). As for the treasure - who knows? Clearly it was not buried anywhere close to the Smith house or barn. The "northerly direction" the men purportedly walked in could mean anywhere between Route 117 and the Assabet River - far too vague a description to entice anyone with a shovel or metal detector to go treasure hunting. I mean it. The people who own the Smith properties on Route 117 are tired of strangers knocking at the door asking permission to wander around with a metal detector - or worse - not bothering to ask. If there is ANY truth to this story, either the Smiths located the treasure (they were a well-off, land owning family going forward), or the site was north of the property, toward the Assabet River. The primary source for this story is the 1891 book Annals of Sudbury, Wayland and Maynard, by Alfred S. Hudson. Page 70 has the core of the story: Smith family homestead, strangers appear during spring storm, stay in barn, borrow digging tools, depart, letter received later from the men, Smith did not go to see what it was about. Does not mention a year and unsure whether it was about Thomas Smith or another of the family. In 1991 the Maynard Beacon recounted the story, as told to the reporter by Ralph Sheridan, town historian. The homeowners at that time said that trespassers show up with metal detectors. Lastly, a 2005 book Buried Treasures of New England, W.C. Jameson, dedicated four pages to "The Maynard Treasure." The core story is identical to Hudson's: strangers visit, borrow shovels for a mysterious errand, depart, later a letter from prison. The tale is heavily added to with details I believe Jameson made up: it specifies six men garbed in sailors' clothes pushing three handcarts who paid a gold coin for privilege of staying in barn, stayed a week and left ten pieces-of-eight when they departed. In Jameson's version the letter is described as coming 18 months later. Then, after a few days delay to complete farmwork, Smith travels to Boston by horse and wagon to get directions for locating the treasure, only to learn that the men had been hanged the previous day.